Before Apple's iPhone and Google’s Android OS burst onto the mobile device scene in 2007, there were few significant advances in mobile technology. Frankly, "smartphones" (if we could even call them that at the time) were boring: they did little more than email, general messaging, picture taking, some basic apps and games, rudimentary internet browsing, and enterprise integration. The biggest players at the time were Microsoft Windows Mobile, RIM's Blackberry, Palm, Symbian, and Linux. They all had their respective place in the mobile world (see chart below). EMEA (Europe, Middle East, Africa) was clearly led by Symbian. Japan was split 60/40% Symbian/Linux (just two years prior, Symbian had completely dominated Japan). China mirrored Japan. North America was split between Symbian (10%), Palm (20%), Microsoft (40%), and RIM (30%). As far back as 2003, before his entry into the Android foray, Andy Rubin stated in Business Week that “…there was tremendous potential in developing smarter mobile devices that are more aware of its owner's location and preferences.” He went on to say that “…if people are smart, that information starts getting aggregated into consumer products.” It appears that Andy was more correct than he had ever imagined: indeed, the mobile landscape was about to change so dramatically that it would create a frenzy for smartphones the likes of which we had never seen. In 2005, there were many rumors that Google was exploring ways to expand its reach to device manufacturers with a focus on developing a handset that concentrated on location-based services. Its biggest obstacle was that it did not have a platform from which to accomplish this objective. To that end, Google acquired Android in July of 2005. Its co-founders, Andy Rubin, Rich Miner, Nick Sears, and Chris White, had created what was known as only a small mobile software development company. However, despite its diminutive size, this acquisition spurred immediate interest amongst those in the mobile technology field and prompted many to suspect that Google was entering the mobile market arena. Their suspicions proved to be correct. Almost two and a half years later, on November 5, 2007, Google took the mobile device world by storm by announcing their new Linux-based mobile handset operating system named Android. Not only did they introduce an entirely new mobile OS, they also announced that it was open-source. This was a direct result of the collaborative efforts of the newly formed Open Handset Alliance. Several companies joined this alliance, such as Google, HTC, Intel, Sprint-Nextel, T-Mobile, and NVIDIA, whose goal was to create open standards for mobile devices. The first device directly from Google was the G1 on T-Mobile which launched in September 2008, and included GPS functions, a 3.1MP camera, and an array of Google apps. This was the beginning of what was to become an exciting adventure for Google and for the entire mobile industry. The successful launch of the HTC Hero running Android 1.6 propelled the OS to an unexpected level of popularity. As a result, Android finally began to seriously grab the attention of non-Android users and made competitors such as Apple and Microsoft take notice. The Android 2.0.1 SDK was pushed out on December 3, 2009, followed by 2.1 on January 10, 2010.
camera/video enhancements such as: better onscreen control buttons and the highly-anticipated feature of enabling the LED to illuminate during video recording. There is a growing chorus of rumors circulating that Android 3.0 "Gingerbread" will be released sometime in the fall and that it will include some really exciting new features. We can only hope this is true. For the sake of brevity, this synopsis will include only "game-changing" Android phones in North America. September, 2008: The G1 (also known as the HTC Dream) launches on T-Mobile. Features include: GPS functions, a 3.1mp camera, and a variety of Google apps, such as maps. This release is relatively lackluster but starts to pick up steam with the next device from HTC. Late 2008: Google releases the Android Developer Phone 1 with the intention of giving developers an opportunity to experiment with a real device without being tied to any specific carrier. July, 2009: The HTC Hero. This device comes with its Sense UI that propels the device to the status as a true "iPhone competitor." While it shares some UI features with the iPhone, it also offers its own unique offerings that differentiate it from and improve upon Apple's handset. November 2, 2009: One of the most significant game-changers in the entire smartphone industry, outside of the iPhone, is when Verizon releases Motorola's Droid. They aggressively market this device with their "Droid Does" advertising campaign that specifically contrasts what the Droid can do against what the iPhone cannot. The strategy works. Droid goes on to sell over 1 million units within its first 74 days on the market. January 5, 2010: Google holds a press conference and officially releases the Nexus One, the first, and potentially only, completely Google-branded consumer Android device. It is considered the first Android ‘superphone’, due to its beefy 1Ghz Snapdragon CPU. Their attempt to shake up the phone industry with their online only distribution model is later canned, due to weak sales. April 29, 2010: The HTC Droid Incredible from Verizon comes out with a bang and is initially fairly well marketed. Its updated Sense UI is a nice addition to an already great custom UI. However, due to AMOLED screen shortages, the device quickly sells out and its "ship date" keeps getting pushed later and later into the summer. Needless to say, people are not "incredibly" impressed. Verizon later states that they will now use TFT LCD displays for future Incredibles. Is it too little, too late to save the Incredible from an early retirement? June 4, 2010: Sprint releases the HTC EVO as its newest flagship device in the hopes that it can save its fledgling company from "has been" status. It appears to be working. Sprint sells more Evos than any other device on its network and also sells out several times since its launch. Its 4.3" screen and Sense UI interface is, to many, a better choice than the iPhone 4. June 15, 2010: The Droid saga continues with the Motorola Droid X and consequently pushes the Incredible to "second" class status as the X becomes the latest and greatest flagship for Verizon. So far, it seems that Verizon is doing everything right with the launch of this device, most notably hosting the CEOs of Verizon, Adobe, Motorola, and Google to make the grand announcement. Its "ginormous" 4.3" screen, non-Motoblur UI, full Flash 10.1 and Froyo 2.2 (later this summer), DLNA support, 720p video recording, and Wi-fi hotspots, are just some of its packed powerhouse of features. Many critics state that this is now THE Android device to beat. Summer, 2010: Samsung is on a quest to dominate the mobile device world beginning with its Galaxy S series smartphones running Android. The S series will launch in 110 countries this summer and is already confirmed for all four major carriers in the United States. While the Galaxy S is the overarching name of the series worldwide, each carrier in the United States is giving its own special name to the device to differentiate it from other carriers: Captivate on AT&T, Epic 4G on Sprint, Fascinate on Verizon, and Vibrant on T-Mobile. As the reader can easily see, Android has come a long way since its early days of 2005 and earlier: from just a “notion” in the mind of Andy Rubin back in 2003 about what a device should offer, to Google’s acquisition of Android in 2005, along with the most recent advancements of the OS, and the screamingly fast pace of new device releases. 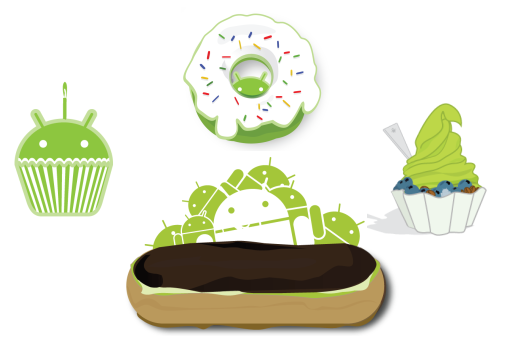 All of this has set us on a very exciting ride with Android. One can only expect that this trajectory toward becoming the number one mobile OS in the world will continue. With its release onto tablets this year and with Google TV (and Google Music?) this fall, we can only imagine where this journey will take us.